It’s a world without superheroes... just like ours, except for one thing. There USED to be superheroes. Then one day, almost exactly fifty years ago, it all disappeared. All the bad guys and all the good guys had a war and then they vanished, taking their powers and the very ability to HAVE powers with them. There are mysterious heroes and villains, but they don’t have super powers. What they do have are helpers—Tricks—people who give them an edge, or maybe just a sandwich. Among these heroes and villains are former minor super heroes who didn’t vanish but lost their abilities. Brand’s grandfather is one of these, a sidekick who lost everything in the war. Brand has grown up with this legacy, raised by his grandfather when his parents were killed. Brand is a Trick; he helps the heroes. But things are about to change. Prophecy says the powers will return on the fiftieth anniversary of the war. The world will once again allow magic, but it will be destroyed because of it. Brand is seeing things that shouldn’t be happening, ghostly figures, strange dreams, powers—super powers—coming back, allies becoming enemies, the social structure unwinding, evil forces hunting him down, blaming HIM. They claim it’s all Brand’s fault, and Brand is starting to believe they may be right! Oh, and scariest of all… Brand goes on his first date. ​TWO STORIES IN ONE BOOK! 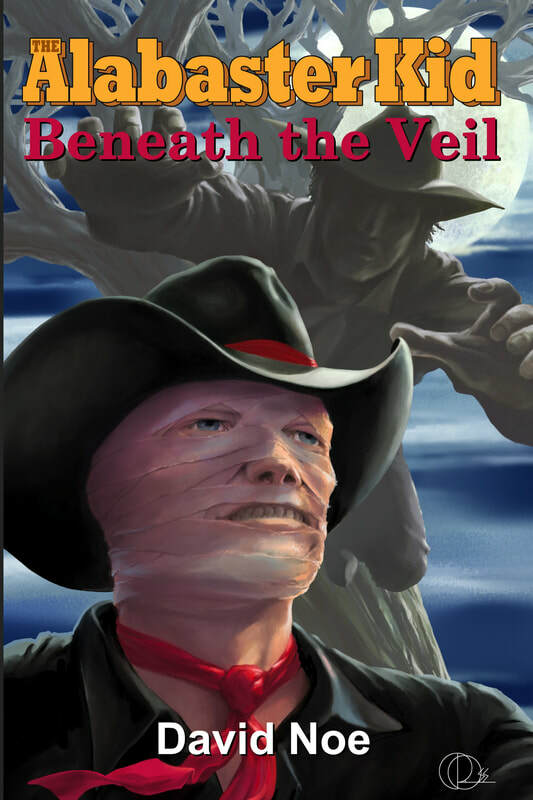 The Alabaster Kid: Beneath the Veil There is ugliness beneath the veil. It churns men's stomachs and turns their hearts to stone. Still they look. Still they search. Still they uncover the layers so purposely laid and fastened and tied. Why...? Because the wounds beneath the wraps need the air and the light in order to heal; the beasts cannot be tamed in the dark. We often hear the west was wild...Now find out why. Slipknot and the Golden Claw What happens when a man steps down, when gravity takes it course and the only thing stopping him from the stained wooden floor is a length of hemp tied to a ceiling beam? What happens when a man gives in to the final call and welcomes the embrace? What becomes of that man when even that fate is denied, when the beam breaks before the neck? When he rises, half crazed and half dead after his mind has already checked out, what stands in his place? What becomes of Mann when the surrender fails? We let the Slipknot take his place. 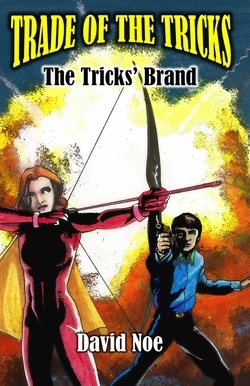 ​Welcome to the Fantastic 4N1, a collection of novellas sharing one single similarity; action! Three characters arise from public domain figures. Purple Scar and Moon Man have their origins in 1930s pulp magazines, while Lobo arises from Dell Comics’ use of the very first African American comic book character to ever have his own comic book. Minsa is a new character, but has been rewritten to accommodate a wider audience. From its strictly rated R origins, it has been tamed to a strong PG13, while still maintaining all of its powerful personal anguish. The monsters tear and scream. The world hides its secrets in the shadows and the corners. Sometimes they are beside us, behind us, below us, waiting to POP UP. Sometimes, they ARE us, and they burn away at our guts, blackening and charring. The absolute worst thing about magic is that it’s not real. We sit on a countertop all alone, never understanding the world around us, allowing strange arcane forces, fingers and hands of the gods, to push us down and force fire into our lungs. And when we fight back by shooting sparks, we are discarded, not even worth fixing. The best we can hope for is to be forgotten, tucked away on the shelf in the closet with the other rejects, with the other unwanted appliances, with the other monsters, in our own quiet Hell. We long for sustenance, bread for the soul, but we know in our heart we will ruin it. Everything we touch turns to ash. Poetry is everything. There is no one definition, no one way, no hard solid clear road. You trek your own path, and leave your own trail, hoping to show others the same steps you took, hoping they understand, hoping they feel your journey. When you do it right, then it’s poetry. Some refuse to follow. Some should NOT follow, because it is the wrong way for them. Some are wandering lost, not even realizing there is another way until they see your swath, your walk, your poetry through the grass and the weeds, through the prairie thicket. There's something there. Do you know what it is? Do you feel that tingle up your spine, that rush across the hairs on your arm? Do you hear that tapping, smell that ozone? Could it really be... a ghost? You know what a ghost is. Everyone knows what a ghost is. The thing is, you may not know what a ghost is. A ghost is the perception of an added presence in a given environment. When you experience what seems like the supernatural, it may very well be. It could also be something totally different and not easily explained or understood or ever discovered by man. There could be innumerable things and occurrences that could be perceived by us as ghostly goings-on. Here are 78 of them, and a special short story at the end. William David Noe, author of, The Trade of the Tricks, brings you a by the numbers approach to figuring out what you are experiencing. It's a no nonsense list of sound practical explanations as to what just might be going on. "How can murder change a person?Just ask Chet. He can tell you that it makes mortal enemies out of former lovers.How can murder change a person?Just ask Minsa. She can tell you that it builds a reality where demons and monsters hide in every shadow and behind every door.Murder creates an unstoppable juggernaut and evil intent in the actions of Chet Masters. Murder makes for deadly ramifications in the notions of Minsa Van Whey.How can murder change a person?How can it not? The Notions of Minsa Van Whey/Psychic Biker is a collection of a novella and three short stories. Minsa is a dark thriller steeped in base language and adult situations. After Minsa and her lover, Chet, kill Minsa’s husband, Chet turns on Minsa. Minsa, not exactly a pillar of sanity, falls apart and runs with Chet in pursuit. Detective and friend, DS Blesser tries to find Minsa first, but always seems to be one step behind. In the end, Minsa has to triumph over Chet physically and herself mentally. Both Psychic Biker stories follow Kelly on his bicycle journey across the country. Along the way he encounters a bevy of interesting characters and is plagued by strange dreams. Seeking enlightenment, he finds only riddles until the answers suddenly thrust themselves upon him. Finally, a short biography is presented on the mysterious life and death(?) of famous cross country bicyclist, John Plymouth. Watch as Minsa makes insanity out of sanity and Kelly tries to make sense of his senses. Follow the chase for Minsa and catch up on the travels of Kelly. Wonder at the dreams of Kelly Pickford and cringe at the notions of Minsa Van Whey." Scan the code on the front of the book with a QR scanner. Try it, it works. It’s all about relation, how you relate, to whom you relate. There’s a reason family and familiar sound so similar. The things that draw us together make us family, but there is more. There are families who only accept the blood. There are those who embrace all who decide to call themselves kin. Voices in My Pen makes a great gift for people you love and for folks you maybe don’t like so much. It breaks all the rules! It’s CRAAAAZY! Believe me, if you think it’s overhyped, wait until you read it. Then, you will KNOW for sure! Despite all the warnings, VIMP will not cause unsightly rashes in sensitive areas or lead to a lifetime of eating stale peanut butter sandwiches all alone in a corner somewhere (Jersey). You’ll REALLY like it, or my name isn’t Fertasty McPellicanbutt (and it’s not). SEEWHATIMEAN??? You can’t afford NOT to buy this book! You will be the envy of your neighborhood/jail cell/book club/janitorial staff. Get in on the new trend. Don’t make me turn this car around! ​Not every story is as it seems. Each ending can surprise us. There is always a hidden ingredient, my friend, a spice that we think shouldn’t be there, yet makes a dish out of a pot of ingredients, a twist of lemon in the cocktail, a dash of salt in the sugar. Relationships are the heart of poetry, both in the literal sense and the symbolic. Human attraction and distraction are our genes, our mind and soul, our songs. When penning these lines, my desire was to step right into the mush and then parade around the living room in it, knocking over the pottery and getting footprints on the ceiling. Mush was just the beginning. I wanted to dive under the carpet and see the gum stuck to the underflooring. I wanted to show what was behind the walls and how it felt to demolish the whole house. I wanted to throw you in the deep end to see if you sank or bobbed like a beach ball. I wanted you to feel the rush of the breath as it escaped from your lungs and you yielded to the fate of the flow. The thrill of drowning feels permanent, but sometimes someone reaches in and pulls you out and dries you off and yells at you for getting too close to the edge. And sometimes you succumb to the deep. Breathe deep. Dive in. You can never swim if you don’t get wet. Sometimes poetry is more than it seems. Sometimes the verse or the words wrap up into tight puzzles that explain the human experience. The imagery, the iconography, the irony combine to mean more than what is written. Sometimes we speak in poetry to emote further than language can express, and sometimes... sometimes we just tell stories. Sometimes the words are the words and the meaning is clear. Sometimes sentences say what sentences mean. Sometimes prose is told in verse. Sometimes lyric adds to the atmosphere. This book is that world. The poems throughout are stories told. Beware, though, thinking that there is no more than that. Stories may just be stories, but like the poetry they emulate, sometimes there is more under the stanzas than is first apparent. Sometimes there are new things among the old. Welcome to Honeycomb USA! This is the iconic American small town, filled with good folks and old fashioned ways, the America of dreams, the hometown we all imagine, the village surrounded by farms and wholesome living. Change is inevitable even in Honeycomb, and that change is working its way into the lives of the homespun citizens that populate this little slice of heaven. Still, the Americana thrives within the diverse characters of the simple town, even though the growing pains can manifest in surprising ways. Buy Welcome to Honeycomb USA! Comedy and tragedy have always been the same play staged by the world and each individual, both at once and throughout time. This book picks up some of those miscellaneous odds and ends and reminds us that it's mostly odd how our life comes out in the end. There’s money to be made in rentals. There is also much heartache, back break, and time to take. You will be challenged at every move. You will have to learn housekeeping, managerial, financial, and people skills at a professional level…or darn close. You will define yourself or you will lose yourself. But if you are motivated, if you are a self starter who is able to learn and relearn, you can make some money at this business. You can be your own boss, with all the perks and headaches that come with it. This book can help you do it. In these pages are hints and rules to help you along. There are ideas to get you started. There are stories to get you prepared. Some of the things you will read will be hilarious. Some will be unexpected, while others make perfect common sense. You will find lists and charts and advice on how to cope, how to start, how to evict, how to live with other human beings. Through decades of experience, I have discovered ways to overcome many difficulties. I share these with you. There is a mind set to renting. Whether you are the tenant or the landlord or the manager, you must know how to act, when to act. This book provides facts. It gives you anecdotes and advice. Whether you are starting or running several apartments or mobile homes or houses or lots, or whether you are fixing up an old home, this book shows you what to do when dealing with somebody who is living in someone else’s house.